combats a widespread infection which promotes stomach cancer. Gut flora, or intestinal microbiota, describes the collection of microorganisms that live in the intestines and stomach. While they play an essential role in the body’s digestion and defences, some of these microorganisms may also be responsible for persistent problems such as the microbial strain Helicobacter pylori. What is Helicobacter pylori infection? This bacteria lives exclusively in the human stomach and is the only known bacteria able to survive and grow in such an acid environment. It is thought that 80% of gastro-duodenal ulcers are caused by H. pylori infections, even though in most cases (70-80%), the infection is asymptomatic. Over the long term, however, it induces a range of symptoms such as fatigue and chronic gastric discomfort, as well as chronic inflammation of the stomach and diseases such as stomach cancer – indeed it is believed to be responsible for 60-90% of gastric cancers. Given these estimates, it is possible that Helicobacter pylori claims more lives each year than road accidents, since stomach cancer is especially deadly. Migraines, Parkinson’s disease, cardiovascular problems and certain immune diseases have also been linked to Helicobacter pylori infection. It is clearly a significant problem given that 25% of Western populations are thought to be infected. How can you tell if you have been infected by Helicobacter pylori? Diagnosis of Helicobacter pylori infection includes tests for antigens in stools or antibodies in blood, urea breath tests and endoscopic biopsies if your doctor advises it. How can you get rid of H. Pylori infection? H. pylori is a resilient strain which can be difficult to eliminate: due to what seems to be increasing resistance, it may respond poorly to antibiotics, the only treatment offered by conventional medicine. It is responsible for most cases of heartburn, gastritis and gastric ulcers, the seriousness of which is well-established. The good news is that scientists have recently discovered the properties of a bacterial strain called Lactobacillus reuteri, and more specifically the inactivated strain DMS 17648, isolated and patented by the Germany company Organo Balance. This strain has proved very effective at fighting Helicobacter pylori, without the disadvantages of conventional antibiotics. It has the particular feature of coagulating in the stomach by forming co-aggregates with the Helicobacter pylori bacteria, thus decreasing the toxic load in the stomach and reducing the risk of developing gastritis or a gastrointestinal ulcer. It is the only strain among 700 different strains of probiotic to be recognised as the specific antagonist of Helicobacter pylori. What are its advantages over antibiotics? Once coagulation has taken place in the stomach, the resulting aggregate is excreted by the body via the digestive tract. Gut flora therefore remains unaffected, contrary to the effects of a typical three-week course of antibiotics. Furthermore, H. Pylori Fight does not cause diarrhoea or taste disorders unlike antibiotics which are not specific treatments for eliminating Helicobacter pylori. What benefits does this strain have compared with other probiotic strains? it can withstand the acid environment of the stomach. The properties of Lactobacillus reuteri have been investigated in two clinical studies. In one, a dose of 250mg a day was tested against placebo for a period of two weeks. The other was a blind study (in which participants did not know whether they were taking the probiotic or the placebo), using the same dose. In both cases, researchers observed a significant decrease in the toxic load of Helicobacter pylori in infected subjects. 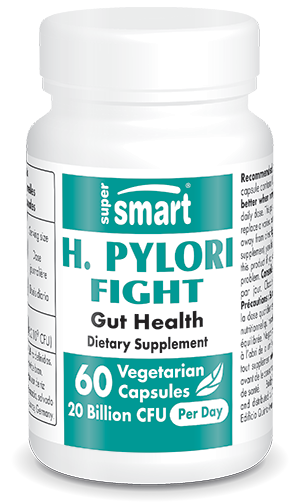 Together, these digestion-related benefits make H. Pylori Fight an essential supplement for improving stomach problems and preventing the diseases associated with Helicobacter pylori. It constitutes a rare, natural treatment for eliminating Helicobacter pylori infection. Once eradicated, reinfection is rare. Treatment can therefore be considered definitive but it can be prolonged with the use of the formulation Digestive Enzymes to facilitate digestion, and the supplement Mastic Gum to protect the gastric mucosa from future infection. Each capsule contains 100mg of Pylopass™.